The gift of a well in loving memory of a friend or family member may be given by an individual, a family or a group of friends. A memorial well card will be sent to the family on your behalf. At the passing of a loved one, a family may choose to ask that donations be given to Wells of Hope International instead of sending flowers. This request may be included in the obituary with Wells of Hope International’s website address and mailing address of where to send their donation. 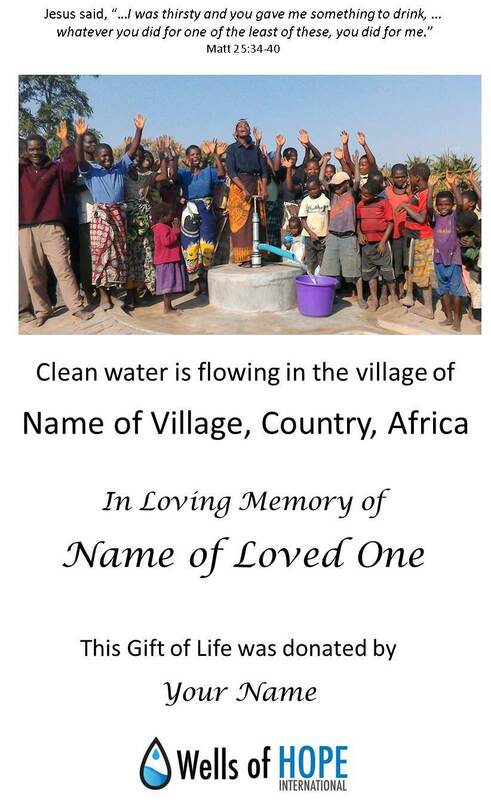 When the well is completed, donors and the family will receive a picture of the community, the name of the village and country in Africa where the memorial well is located. May it be a comfort to you to know that this well will be a memorial to your loved one’s life as the clean water brings a healthier life to the people of the community receiving the well. $450 will build a well for an entire community. We will send a card notifying the recipient of your gift to Wells of Hope International, Inc. “In Honor” or “In Memory” of their loved one.